Micah Akuezue is a Eugene V. Cota-Robles Fellow and graduate student in the Department of Political Science at UCLA. He studies political theory, under the mentorship of Giulia Sissa, as well as race, ethnicity, and American politics. Micah’s current research, situated in classical Athens, focuses on agonism and political violence in democratic politics. His dissertation, “Organized Noise: Agonistic Politics and Democracy in Ancient Athens,” explores the concept of agonism and its role of contest in Athenian democratic politics, an investigation that considers both contemporary work in democratic theory, as well as texts in the classical Greek tradition, including Homer, Thucydides, and Euripides. 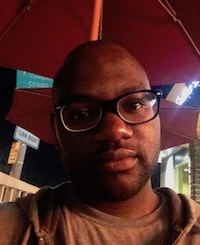 Micah’s other research explores racism and democracy in U.S. political and social history, 20th century African American literature, and the role of praise and blame in ancient Greek theatre. He holds a B.A. in political science from the University of Michigan, in his hometown of Ann Arbor, MI.